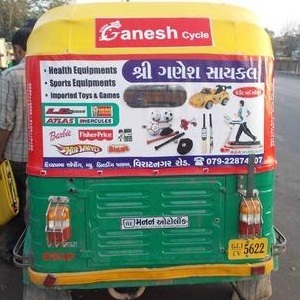 Auto Rickshaw Advertising is the most effective and affordable medium of outdoor advertising. Standing out from the clutter of hoardings, posters, banners and kiosks, this walking medium goes to every part of the city, as it manoeuvres into even those areas which other vehicles cannot reach! Auto Rickshaws as we all know, travels through many areas per day, exposing itself all the time. The exposure is from all angles from morning to evening, and to the genuine target called the crowd; and at all time. In the situation of a boring signal, what’s written on a rickshaw gives some relief in the form of a temporary involvement in the pollution filled atmosphere at that time. Sometimes it helps passing time to the desperate-to-move, people at the signals and people tend to read the prints without fail. Multi Plus Services have a good convenience with auto rickshaw associations in different areas of the city. They are ready to put up the banners in or out side of the rickshaws. This can come up with a high branding of your product.